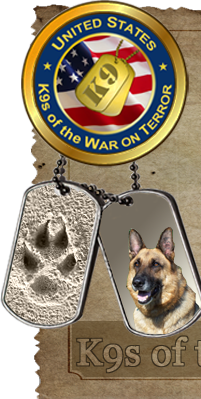 The K9s of the War on Terror is constructing this memorial to represent the cooperation between the military, government, and law enforcement during this nation's War on Terror. 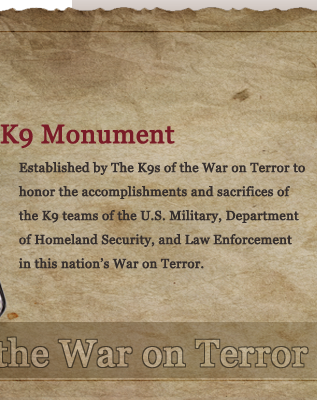 Skylight Studios, Inc. was chosen as the designer of the K9 Monument. 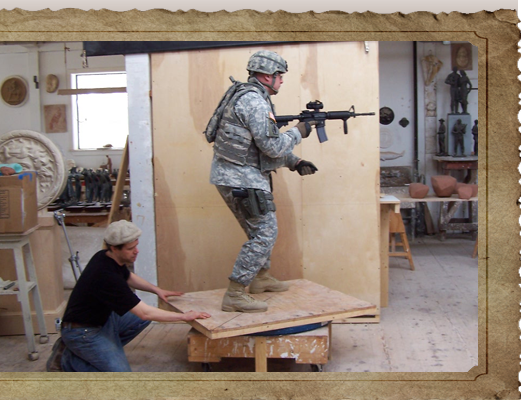 To create a monument from an idea to the finished bronze involves many processes and steps. Potential ideas are first sketched in order to visualize the design. With reference to the finished drawing, a small clay model is crafted to help realize the design in three dimensions. The third dimension always adds other elements to be considered from an aesthetic point of view. This small model is further developed by creating a larger model that is a third of the size of the final sculpture. This model must be accurate in terms of scale and proportions and is studied quite extensively. The proportions must be perfect since a small mistake becomes magnified when larger. Once the scale model is perfected, it is used for measurements to fabricate a steel armature for the full-sized model. The clay utilized to sculpt the model is not self-supporting, so the armature acts as a skeleton to sustain it. The armature is customarily made of steel tube which is welded at the joints. Its accuracy is crucial since it needs to be constructed to fit precisely inside the forms of the finished sculpture. It would be difficult to alter once the clay is on. The steel is sealed with shellac and the clay is built up on the armature from the inside out. The clay is actually an oil-based wax medium that will never dry unlike water-based clays. The full-scale model is slowly built up with this clay and the surface detail is meticulously completed. Once the full-scale clay model is done, it is prepared for a mold. The mold is made using silicone rubber which is brushed in layers over the clay surface. The rubber comes as a liquid, and when a catalyst is added it becomes a flexible solid. It is backed with an additional mother mold made of reinforced plaster. The mother mold will act as a matrix to hold the rubber in the exact form once it is stripped from the model. The plaster part of the mold is fabricated to consist of multiple pieces and the rubber is cut to fit within each individual part of this mother mold. The detail of the clay is destroyed in this process, but the clay is removed from the armature to be recycled and used for the next sculpture. The rubber mold is a negative and it is used to make a positive wax cast. The wax is brushed and poured into the molds to a thickness of about a quarter of an inch. After the wax is removed from the rubber mold, it is touched up and another series of molds are produced to form impressions of the inside and outside of the wax surface. These investment molds are made at the foundry and when completed are moved into a burnout oven. Because of the heat of the oven, the wax gradually melts out of the bottom of the molds, thus the term “lost wax.” The molten bronze is poured into the cavity where the wax was and it picks up all of the surface detail that was inherent on the surface of the investment mold. Once the bronze is cooled, the mold is destroyed to reveal the cast reproduction. Since it was poured in parts, all the sections are cleaned and chased of flashing, vents, and seams. The individual parts are welded together and the surface of the bronze is fully finished. The patina, or rich color, of the bronzes is obtained by heating the metal and applying successive coats of chemicals which alter and enrich the finished colors and tones. This surface is then protected by coating the bronze with incralac and wax. The finished bronze will be shipped to the Memorial site and will be installed on its stone base. Since this technique is so involved, it takes a good amount of time. Some memorials can take a year or years to complete. The process to create a bronze is essentially the same as that performed during the Renaissance although some of the materials are different. A bronze which is well-made will withstand the outdoor elements and will endure with time.